You'll be pleased to hear that after a bumpy and hectic start to the year I am actually caught up with this project. Hmmm, I should rephrase that. 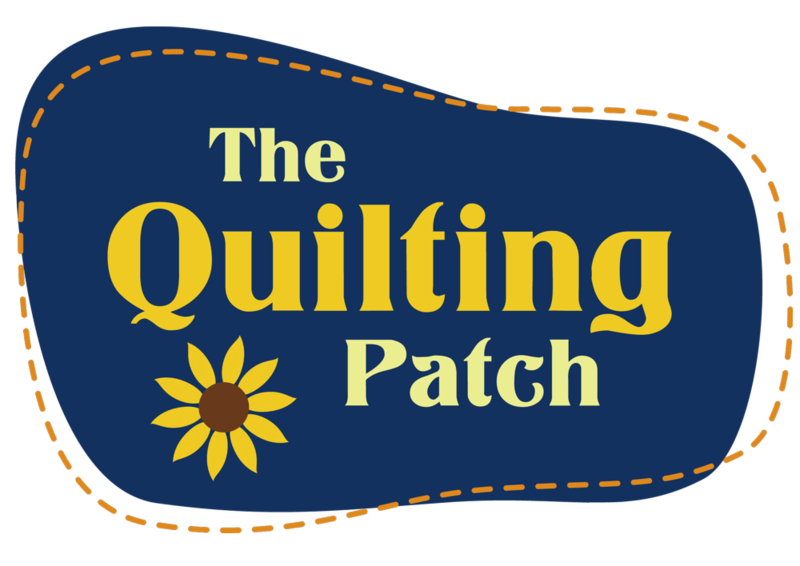 I have all my fabrics for the first two rows cut out and ready to take on a quilting retreat on the 1st June. 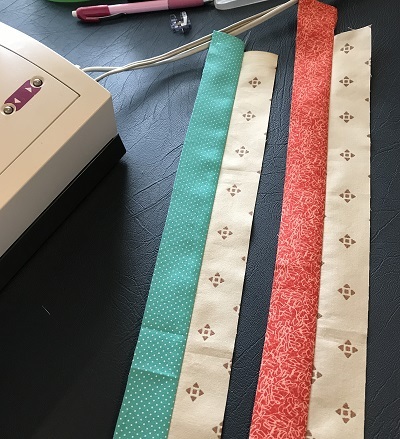 I did, however, cut up and sew a trial run of this next border last weekend and I'm quite happy with the way it has sewn out. So this time you are getting photos of my blocks as well as the usual insructions. 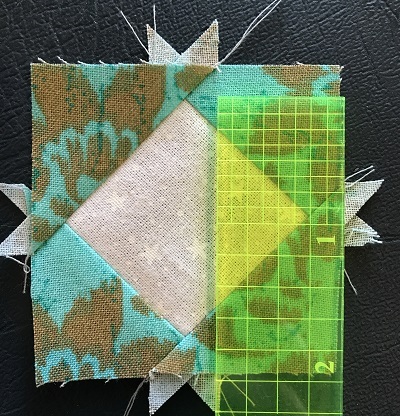 The block is a rectangle that should measure 8 1/2 x 6 1/2 inches. Its super important that you finish up with this measurement. My suggestion is that you make up one block as a tester and if it doesnt measure up do some investigation. What to look for if its not measuring up..
1. Have you cut it right? Go abck and check your measurements. 2. 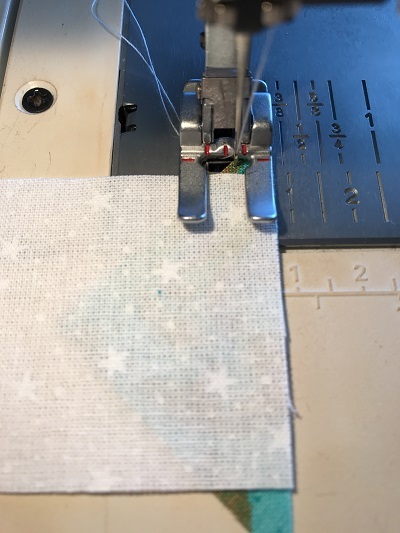 Are you sewing with a scant 1/4 inch? 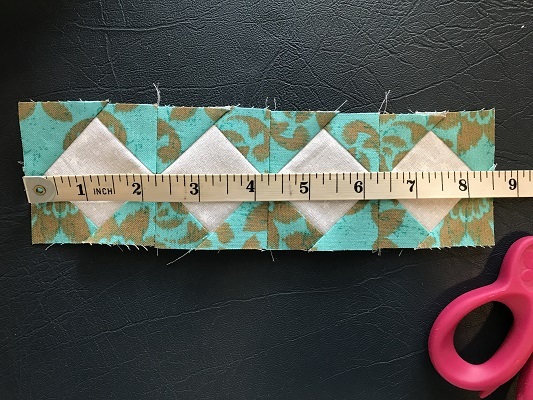 In patchwork we cut with a regular 1/4 inch off your ruler, but we sew with a scant 1/4". This measurement is slightly smaller than the 1/4" youll see on your ruler or tape. PLEASE NOTE there is a section we are not going to piece on this block, rather we will add it as a plain strip in between rows.that is why this block ends up as a rectangle instead of a square. 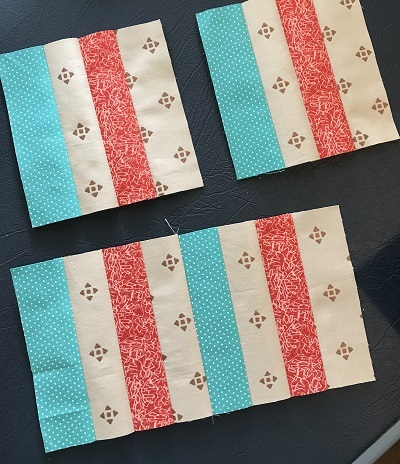 Also with the A strips, there is no need to cut them back to 4 1/2", just cut them 1 1/2" by the width of fabric. 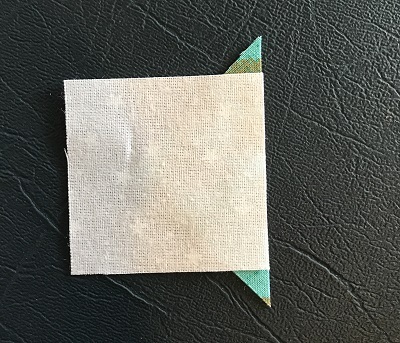 This block is made of two sections - a strip set and a square in a square. 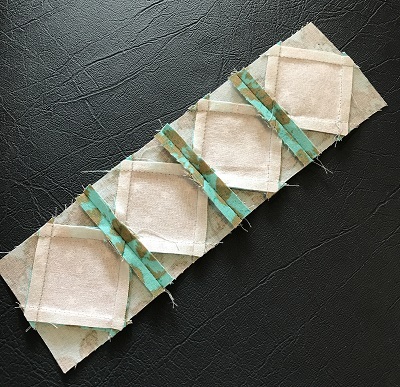 I recommend only sewing strips of two together and then sewing the "twos" to each other, because if you sew 8 strips to each other youll find they start to twist. 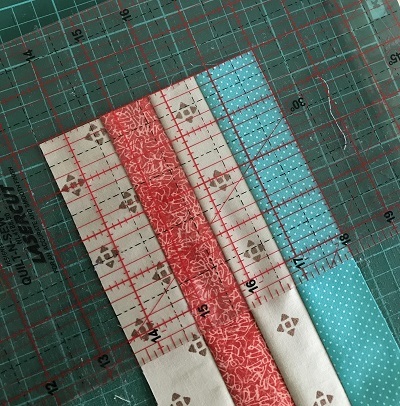 Once you have a strip set of 4 strips, you can croscut them to 4 1/2" long. 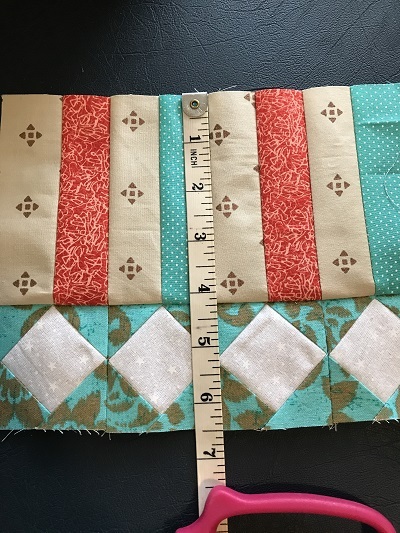 Measure your block of 8 strips - it should measure 8 1/2" x 4 1/2"
The lower section is made up of quite small square in a square blocks. These can be fiddly, so take your time and enjoy the process. I have the same attitude to my sewing as I do to cooking. Sometimes I'm making something simple and quick and its ok to be rushed. Othertimes I want a really good result, so I take my time and do each part of the task with care and precision. This is one of those times. I'm going to run through these instrucions slowly, I hope it's not too annoying, but at the end you should have the skills to make a perfect square in a square block every time. This block consists of a centre square with 4 x triangles around it, tipping the centre square so that it sits onpoint. It sounds simple, and it can be just that if you take your time and follow a few rules. Then you'll end up with a block that hasn't lost its points. 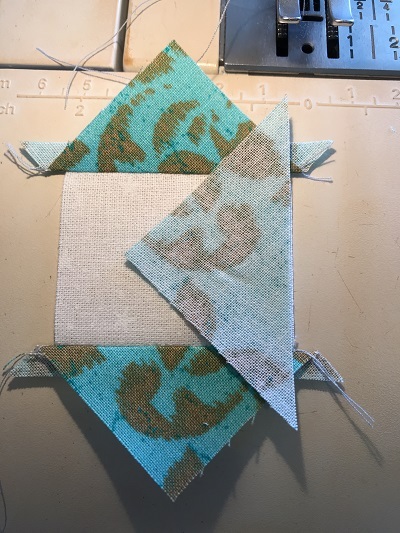 Take a D square ( 1 7/8") and place a B triangle ( 1 7/8") along one edge, centring it so that there is 1/4" hanging over each side. This excess needs to be spread evenly over each side. 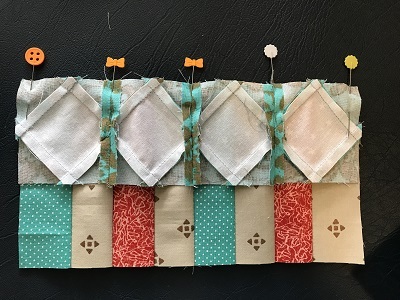 Sew along this edge with a scant 1/4" seam. Press the seam CLOSED first. That means just pressing it how it is, without opening anything. 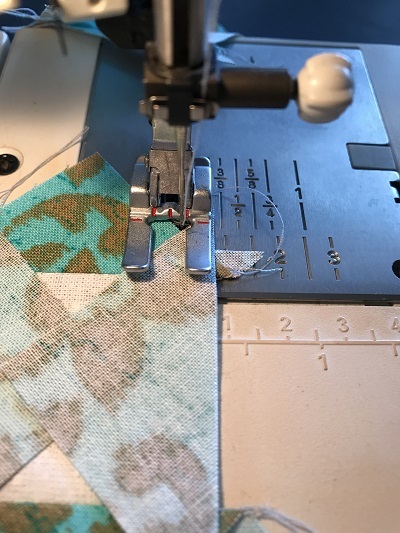 Don't miss this important step - setting the seam is crucial. Next, letting the weight of the iron do all the work, gently open the seam and press the triangle back. Now we repeat that step with the opposite edge. 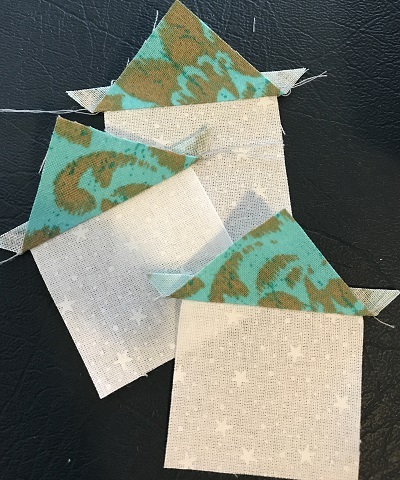 The next step is to attach the remaining triangles to the remaining edges, still focusing on spreading the overhanging fabric evenly between the two sides. Note where my needle is when I'm sewing up this last seam. It is exactly where the two fabrics meet. Press gently again and then check your seam allowances on all four points of the centre square. Do you have a 1/4"? 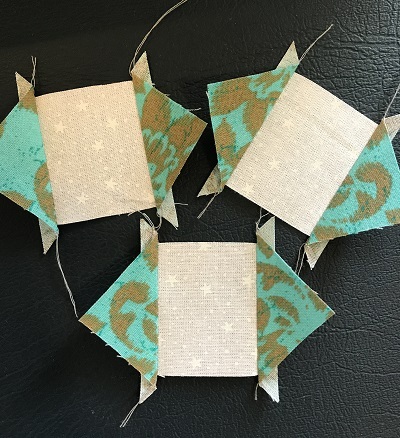 If you dont have a 1/4" of seam space, when you sew these blocks together, you're going to lose your points. Now is the time to fix it. The next step is to join 4 of these units together to form a row. The seams can be quite thick, so I chose to press the seams open, rather than to one side. Measure your block length. Does it measure 8 1/2"? Now you are ready to join this to the strip set you made earlier. 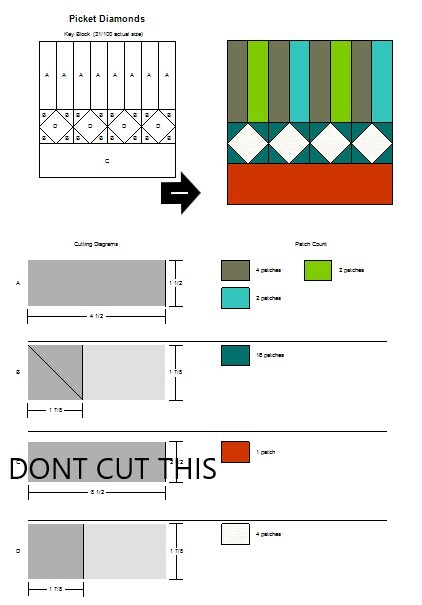 Make sure you pin every seam junction. Measure your block - it should measure 8 1/2" x 6 1/2". See you next time for Row 4!